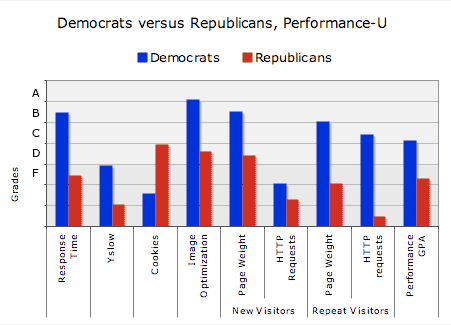 How do candidates’ web sites perform? In honor of Super Tuesday, we thought it would be fun to take a poke at the Presidential Candidates web sites and share with you what we found. How did they do? Overall, atrociously, all the candidates failed the YSlow exam except Mike Gravel who earned a “D”. Page weight was a problem for Barack Obama, whose site weighed in at almost 700Kb. It was even worse for Mitt Romney, whose site weighed a whopping 1,531Kb. I hope he doesn’t have supporters trying to make contributions on dialup modems! Turns out that Huckabee is faster and lighter than Romney. Clinton makes too many requests. And Obama needs to expose more above the fold. I had the pleasure of interviewing Sean Connelly and Katy Newton for YDN Theater recently with YDN videographer Ricky Montalvo. They created the amazing (and award-winning) crime data mashup Not Just A Number in partnership with The Oakland Tribune. After getting tired of watching the homicide count for 2006 climb higher and higher, they decided to humanize the issue and talk to the families of the victims directly. They wanted to expose the story beneath the number and give a platform upon which the community could make the issue real. Statistics can tell effective stories, but death and loss reach emotional depths beyond the power of any numerical exploration. Sean and Katy posted recordings of the families talking about the sons, daughters, sisters and brothers that they lost. 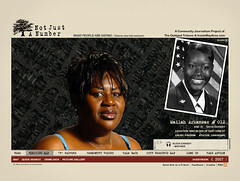 They integrated family photos, message boards, articles and more along with the interactive homicide map on the site to round out the experience making it much more human than the traditional crime data mashup. I also asked them if they had trouble getting data to make the site, and they said the Oakland Tribune staff were very supportive. There weren’t any usable open data sets coming out of the city, so they had to collect and enter everything themselves. This, of course, is a very manual process. Given the challenge of getting the data Sean and Katy didn’t see how the idea could possibly scale outside of the city of Oakland. SOmebody needs to take that on as a challenge. I’m hopeful that efforts like Not Just A Number and the Open Government Data organization will be able to surface why it’s important for our government to open up access to the many data repositories they hold. And if the government won’t do it, then it should be the job of journalists and media companies to surface government data so that people can use it in meaningful ways. This is a great example of how the Internet can empower people who otherwise have no voice or audience despite having profound stories to tell. I’ve been looking for a way to share playlists on my blog and elsewhere online for a long time. It’s been surprisingly hard to find a really convenient way to do it. DRM and industry lockdown have been a big part of that, but there have also been too few technical ways to point to music files that are already publicly available. There are tons of legal MP3’s on the Internet that reside at readable URLs today. Lucas Gonze and his team at Yahoo! solved this problem. They launched a source-agnostic embeddable media player. You can read more about it on YDN. Then you just add an HTML link somewhere on your web page to any MP3 file you want to see in your playlist. That’s it. You’re already done. The link you just made will now include a small play button in front of it, and a mini media player will appear in the browser. They’ve included some other nice things in the code that give you some flexibility. You can create a shareable playlist file, and you can add cover art, for example. It’s the first time I’ve seen a media player so closely aligned with the way the Internet works. “Almost all online music businesses right now are in the distribution business, even if they see other functions like discovery or social connection as their main value, because they have no way to connect their discovery or social connection features with a reliable provisioning service from a third party. But provisioning is a commodity service which doesn’t give anybody an edge. They don’t want to import playlists from third parties because *that’s* where they are adding value. It seems Lucas is thinking about how to get music flowing around the Internet with the same efficiency that text has enjoyed. Very smart. We’ve been playing around with video as a communications mechanism on Yahoo! Developer Network for a while now. Our casual attempts to generate interest in Yahoo! technologies through interviews, screencasts, tech talks, etc. have worked really well. So, we hired a full time videographer/filmmaker named Ricky Montalvo and got him some decent gear to push the envelope a little further. And today we rolled out YDN Theater on the YDN web site to establish a home for all the work he has been producing. The journey here started with a pretty lame but surprisingly successful screencast that Dan Theurer and I did to explain how browser-based authentication worked. It was blurry. We made mistakes. The subject matter was pretty abstract. And neither Dan nor I have particularly strong camera presence. Regardless, it has been viewed over 19,000 times, so far. We kept pushing with new types of videos such as partner showcases with people like Joyce Park, Adam Rifkin, and Leah Culver. We brought the camera to our various Hack Days and produced a particularly funny recap of the London event. And we recorded tech talks from our own staff at Yahoo! and presentations from guest speakers like Grady Booch, Joe Hewitt and David Weinberger. By the time we found Ricky, we knew we were building a program that was going to be really interesting. Yet, we hardly spent any money other than a few cheap cameras and some basic editing tools including Camtasia at that point. The success to date I think has been in large part due to the fact that we haven’t tried to pimp out our videos with any professional plastic gloss or staged demos. We also try to have a little fun with them. Jeremy Zawodny is a really good interviewer. His unassuming yet pointed questions get people to say things they otherwise wouldn’t include on any planned script. And the fact that the videos are raw with few cuts or edits make them feel real, too. There are some good video program ideas floating around here that could be a lot of fun, but now we’re torn between how much time we want to spend building out the video offering and how much time we want to spend on all the other ways the team can evangelize Yahoo! technologies. I’m not sure how to measure that decision just yet, but as long as people are consuming these shows we do with such enthusiasm we’ll probably tilt the scale in favor of doing more video whenever possible. Jeremy Zawodny and I spent some time both with lead engineer Ryan Kennedy and then a Hack Day hacker Leah Culver to screencast the tools they each built using the Yahoo! Mail Web Service (Mail Search and Flickr Postcard). Jeremy asked the hard questions while I recorded and produced the video. You can see them both below. With this screencast we decided to also offer downloadable versions in addition to the web-ready and shareable Yahoo! Video versions. We debated a bit about what downloadable format to offer and decided the ipod-friendly M4V was the best choice. The best solution is probably to offer all formats and posts on all the video sharing sites, but we didn’t have time for that. Here is the full download for Ryan’s demo, and here is Leah’s. Any experience you have or thoughts on how we should share these types of videos would be welcome. Jeremy Zawodny and I produced another screencast last week, a look inside Pipes with Pasha Sadri and Ed Ho. The Pipes guys shared their insights while we asked a few questions and recorded the screen and the audio. I’ve been trying to improve on each screencast with a new trick or some efficiency. This time I tried to mix in some relevant still shots in the editing process to support the voice over. Camtasia was a little stickier here but still very easy to use. After setting up the production and editing out some bits, I used SnagIt to capture web site screen shots and crop them to focus on a small area. I imported them into the production. Then I added the screen shots to the Picture-in-picture track. Lastly, I zoomed in on each PIP file so it took up the whole screen and slid it along the timeline to get the right positioning with the audio. There’s a segment toward the end of the video where Pasha is saying some really interesting stuff, however I didn’t have anything relevant to splice in visually. So, I didn’t quite get this right. But you’ll see that it works nicely in certain parts of the video. It keeps the pace going while people are talking. It also allows you to grab additional media that you didn’t think to pull up while recording the original video. For example, Pasha mentions that there are several sites that have begun creating tutorials for Pipes, so I grabbed screensots of 3 that I found and layered them in. Micah posted an interview on his blog that I gave him as a new member of the team. Some good stuff there, too. An exciting part of my job is the exposure I get to startups that are doing new and interesting things. Last week, for example, Jeremy Zawodny and I sat with the Renkoo team while they walked through all the ways they are using Yahoo! technologies in their product. We captured what was happening on screen and recorded the conversation using Camtasia. Then I edited it into 2 parts: the first is more of a demo and the second is a discussion of the technologies. I saved it as a video file, uploaded it to Yahoo! Video and finally posted it to the YDN blog this morning. It’s nice co-marketing for us both. Yahoo! gets to show off how powerful its services can be, and Renkoo gets a nice platform through YDN to demonstrate the clever things they’ve done to a broad audience of peers. You can watch the first part of the interview here.